Zoë Baird is CEO and President of the Markle Foundation, which works to realize the potential of technology to achieve breakthroughs in addressing some of the nation’s most pressing issues. Today as advanced technology and automation change the very nature of work, Markle’s priority is advancing solutions towards a skills-based labor market that will enable Americans to transition to the opportunities of the digital economy. Markle’s workforce initiatives include Skillful and the Rework America Task Force. They follow Markle’s success in creating the policy and technology architecture that has enabled improvements in healthcare, national security, and access to the Internet. Ms. Baird is a New York City Ballet board member and serves as a Senior Trustee of the Brookings Institution. 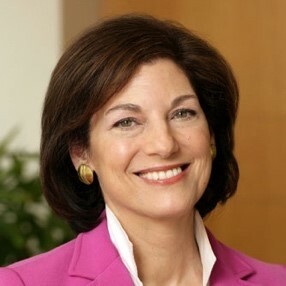 She was a Council on Foreign Relations trustee and served on boards of several publicly held companies and government advisory boards, including as co-chair of the Department of Commerce Digital Economy Board of Advisors (2016-2017) and a member of the president’s foreign intelligence advisory board and the National Security Agency advisory board. Prior to Markle, she served as Senior Vice President and General Counsel of Aetna; Counselor and Staff Executive at GE; partner in the law firm of O’Melveny & Myers; Associate Counsel to President Carter, and Attorney-Advisor at the U.S. Department of Justice. She is also Founder and Chairperson Emeritus at Lawyers for Children America. Ms. Baird holds an A.B. Phi Beta Kappa and a J.D. from the University of California, Berkeley.